Taxes and cleanings extra. 1 month minimum. WIFI included. No Smoking Condo. No Pets Rentals are not transferable to another party. We had issue with check-in and office was able to resolve this quickly. We would highly recommend staying here! The room is great, having the divider was perfect for us as we could put our 3yr old to bed and we could still stay up. Location wise we also loved it as we were a bit away from the hustle and bustle of the main strip of waikiki but still only a bus ride away. The Lagoon next door is fabulous for children and so are the hotels pools. The hotel itself is beautiful as is Hawaii! Traveled with my mom. This was one of the few places with two double beds. (I really didn't want the hide-a-bed) The condo was clean with a great view of the harbor and surfers. Nice shower, but had to put a towel down in the shower so mom didn't slip. 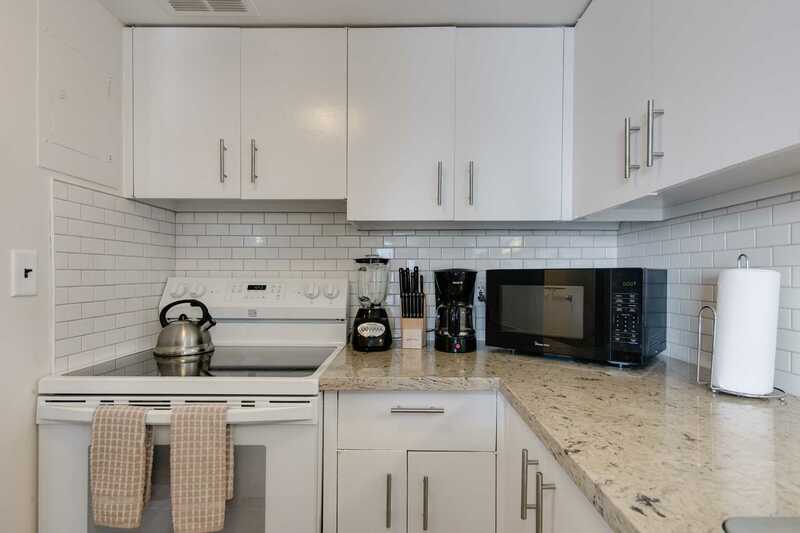 Functional kitchen with all the necessities including a squeaky microwave. The Ilikai is across from an ABC Market. Handy. 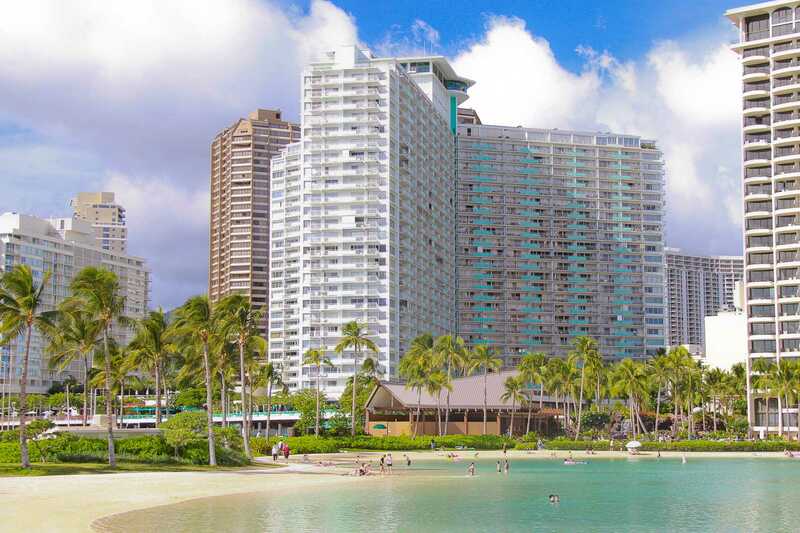 We loved the location and the fact that the hotel has been in the heart of Waikiki for so long. Very clear and well looked after property. 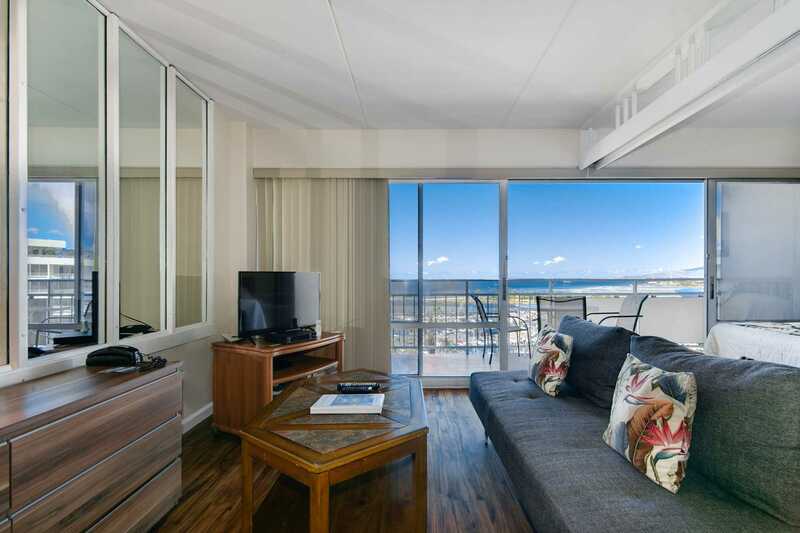 Stayed here from 11th -14 of April.Nice clean condo in a Waikiki Icon of a hotel, the Ilikai.Newer open concept kitchen was a nice touch.We always stay on the ocean front side, but was unavailable for the first few days of our trip.This was a very suitable for the interim.Would recommend to others. My vacation at this unit was perfect! It was very clean and it was supplied with everything I needed as I buy my groceries. I spent a lot of time on the lanai when I am not doing excursions or sitting by the pool or beach. The view is spectacular and of course the Hawaiian sunsets are #1. If I want to go on a tour or head on the Waikiki Trolley, the bus companies pick me up right in front of the hotel. It is very convenient and I enjoy walking down pass the marina to the pier. You can also catch a sunrise. 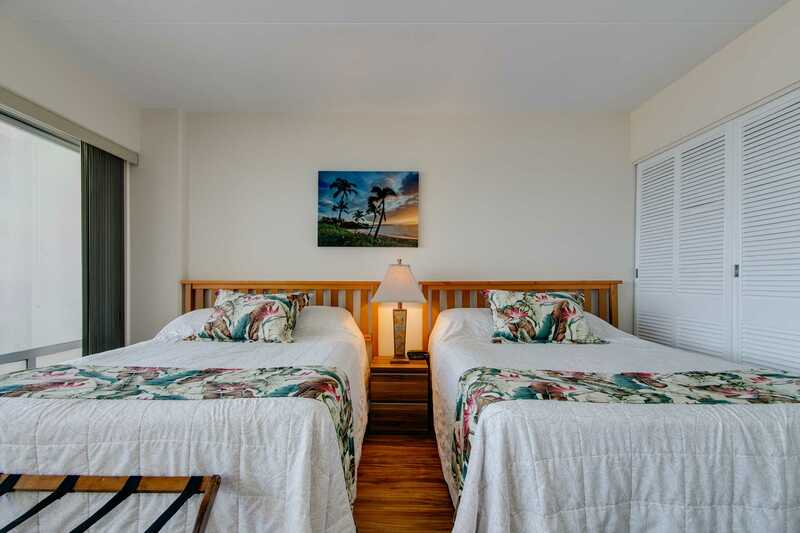 I am very happy with Hawaii Vacation Properties with their continued excellent service and spacious, beautiful units! We stayed for 2 weeks and had a wonderful time. We had an unobstructed view of the ocean and marina which was very important for us. The staff was helpful when we need assistance when the TV set stopped working. I would have given this review 5 stars if not for little things that the owner can easily change for the better. The comforter had seen better days (or nights) and had some stains on it (not sure if it was freshly laundered before our stay). We were provided 1 very small tube, one time use shampoo/conditioner for one person (4 guests in the unit), the toilet bowl was not as clean as expected. The kitchen was well equipped although the bread toaster was not properly working. You have to hold down the lever in order for it to work while toasting. Other than those minor issues, we enjoyed our stay in the condo and will definitely return for our annual HI vacation. Great condo and view of the marina It was as described. 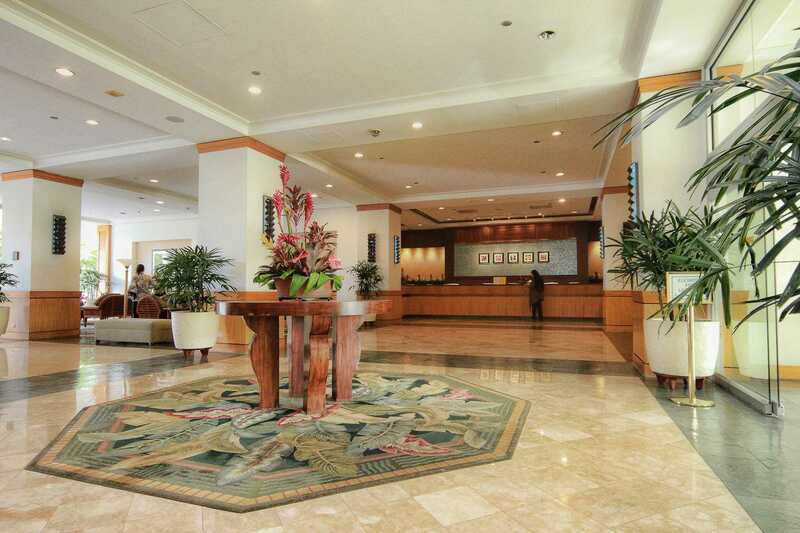 Good location, buses next to hotel, walking distance to Ala Moana center and Waikiki. Would stay again. The balcony (lanai) view is of the marina. The unit itself is as pictures show. 2 double beds and a sofa bed with a full kitchen, refridgerator and microwave. Coin operated laundry facility for public use - as part of the hotel. The unit itself was clean, cosy and comfortable for 4 adults and 1 child (11 years old). Macdonalds and ABC store directly across the road, very convenient. Ala Moana shopping centre is approx. 10minute walk away. We stayed here in April 2017. I was very pleased with our stay. 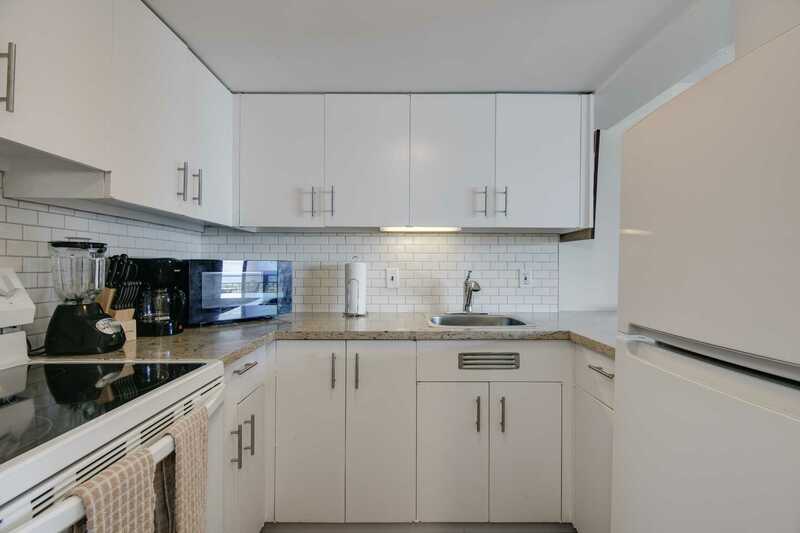 Although it's not a condo with extremely modern decor, it was clean and all amenities were as per the condo description. The views are amazing with unobstructed ocean views (the main reason we chose this one). Check in was great as I just paid online and got a code to get in the condo..not like your normal hotel check in. I walked through the lobby of a hotel next door a few days later and was thankful I didn't have to stand in line and wait to be checked in like those hotel guests. The only thing I wasn't too pleased with was the noise of the air con.However, The evening air was cool enough to not have the air con on all night. Our stay at this condo was enjoyable, everything was as described and all instructions were clear. 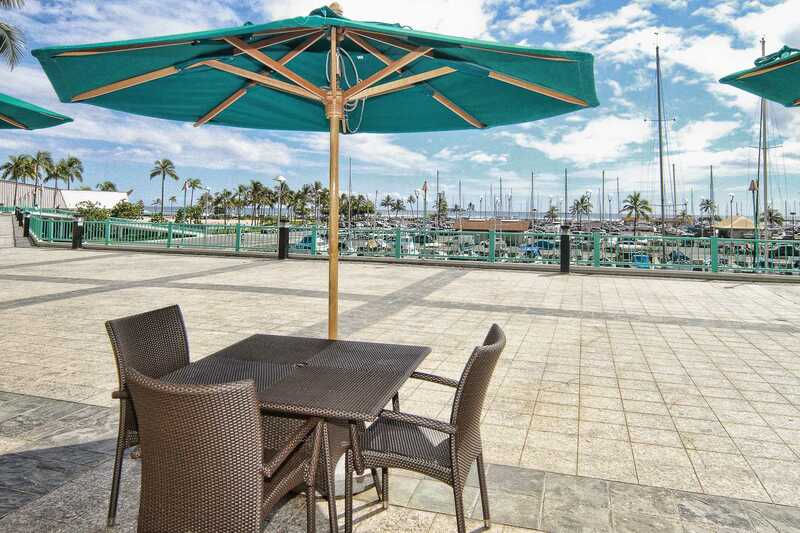 The location was very close to the beach and a walk able distance to Alamoana shopping Mall or you could catch a bus. Plenty of restaurants close by. We would stay here again. We stayed 7 nights over Christmas. We were really pleased with the accomadation. It was to a great standard. The bedding configuration worked really well for us as we had two young adults with us. Plenty of towels provided which was also good. I found the bed really comfortable. The air conditioner cooled the apartment really well, it was a bit noisy, but we were able to sleep through it. 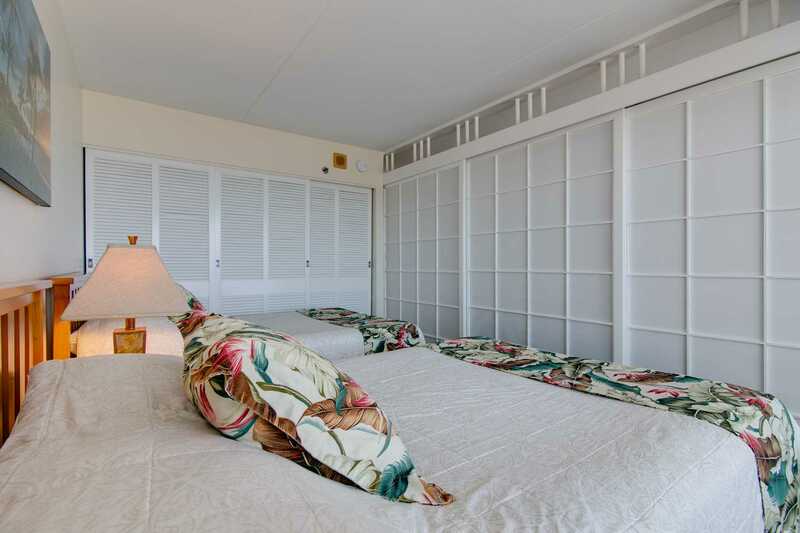 The apartment was so well placed to enable great shopping expeditions, and such easy access to the beach. I prefer being at the quieter end of Waikiki, as you can always walk there when needed. Such happy holiday memories. 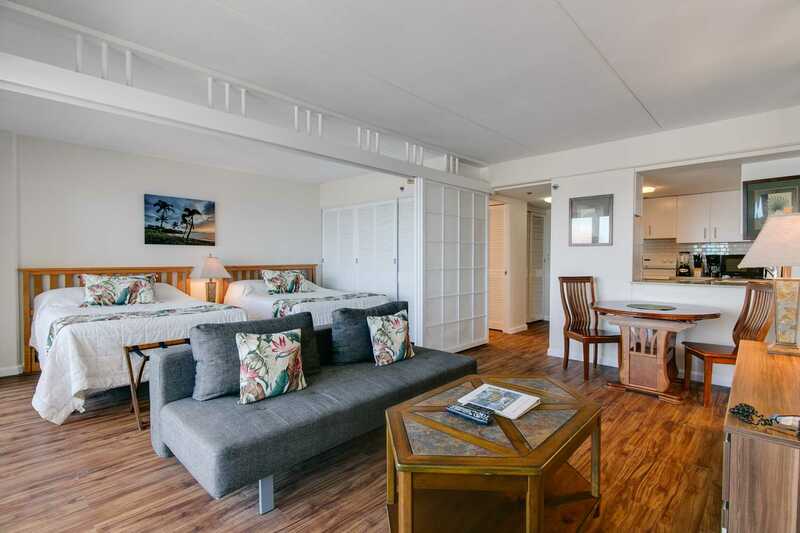 I will definitely book in this or a similar apartment again in the Ilikai. Such an easy holiday. Oh and the views, well they were amazing. Morning noon and night, just stunning. Illikai 1504 - Amazing view. A little outdated. Value for the price. 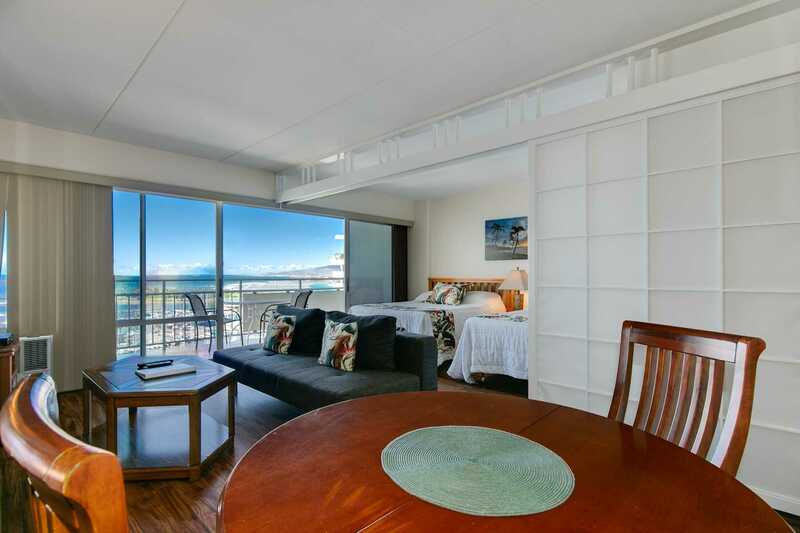 Summary - we are a family of 5 looking to stay in Waikiki, next to the beach, with a great water view, full kitchen and didn't want to spend a ton of money..and this unit was perfect for us. 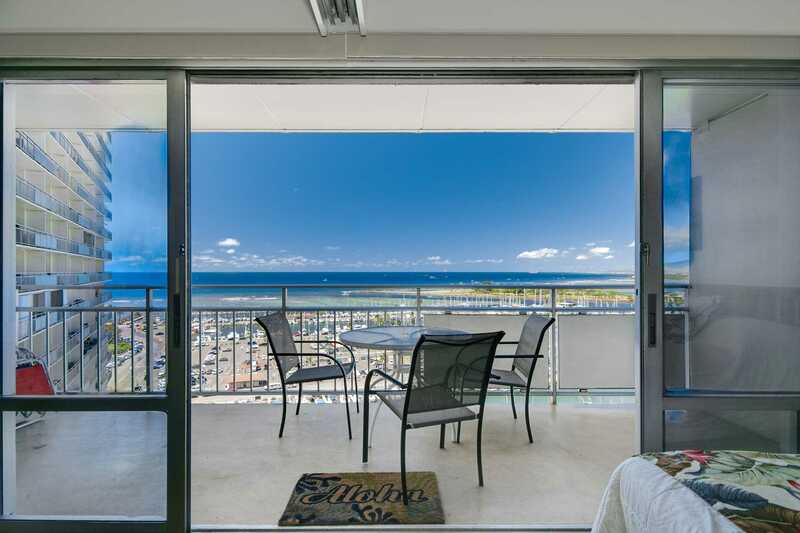 Unobstructed view from lanai and inside of condo of marina, magic island, and ala moana beach. 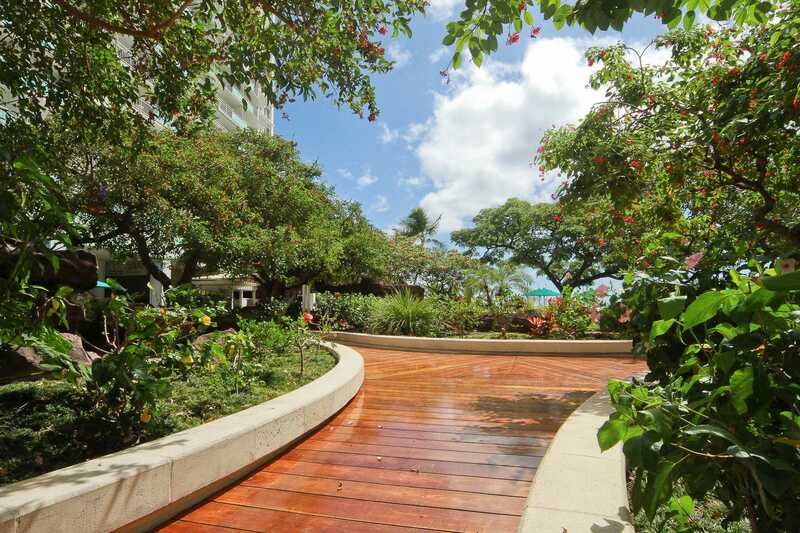 ~10-15 min walk to the Royal Hawaiian Shopping center. We used the Ilikai valet parking at $28/day (in/out privs all day) rather than saving a few $ and having to walk a block or more in the heat each time we needed the car. "The Bus" stops right in front of the Ilikai, so it's super convenient for those who do not have a car. The room has a sliding screen between the 2 queen beds and the LR area (with a fold out couch), so those who wanted to sleep had privacy from those watching TV. Other units in Ilikai didn't have this separation, which is something we specifically wanted. The room does need some maintenance..the sliding screen, closet doors were not attached at the floor, the AC unit is noisy (the room faces afternoon sun full on, so gets hot) - minor things overall. Plenty of storage, extra sheets, blankets, pillows, and towels (bath and beach). Kitchen has pans, pots, utensils, dishes for maybe 8 people - we cooked full breakfasts and some dinners for our family of 5 with no problem. Most of our time was spent out and about on the island and some evenings in Waikiki, so this was a perfect base for us to just relax/recharge and enjoy the view. 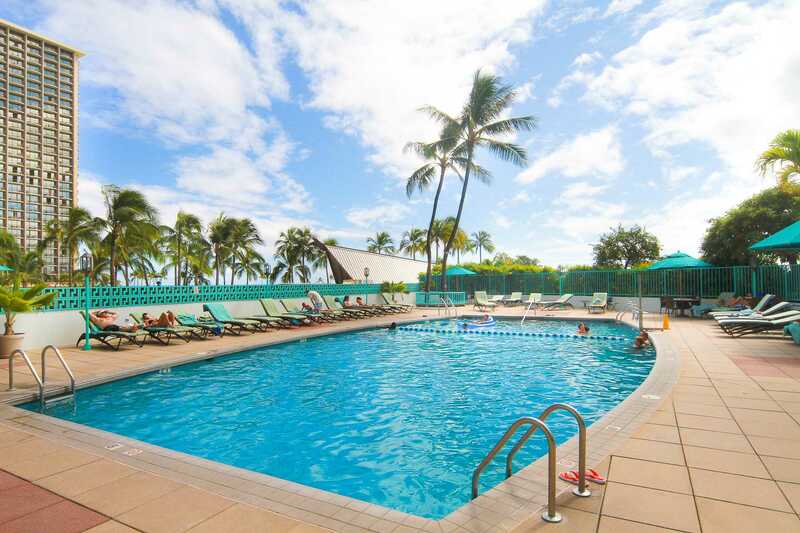 Booking through hawaiivacationpropertiesllc.com was easy and clear. Just a really nice experience overall. Thank you. We did install a new, powerful AC this year. 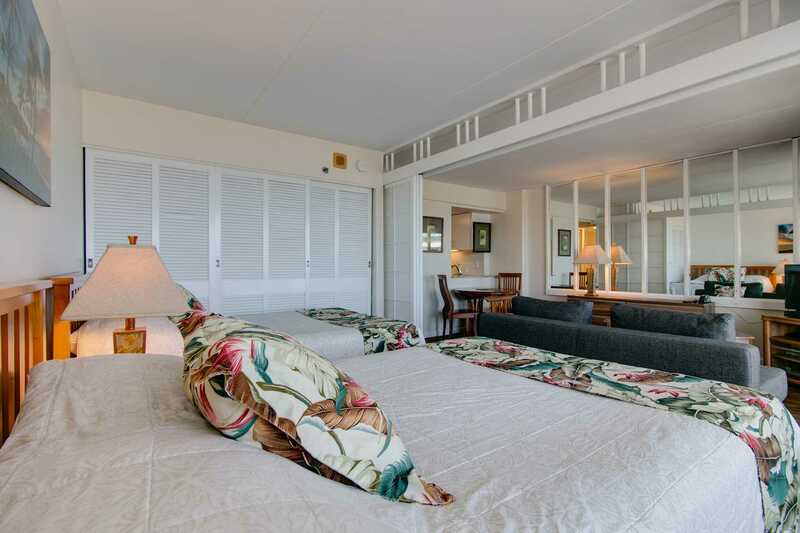 The Ilikai 1 bedrooms have 500 sq. ft. interiors. you can hear an 18,000 BTU AC when it is on. This condo has some renovations. 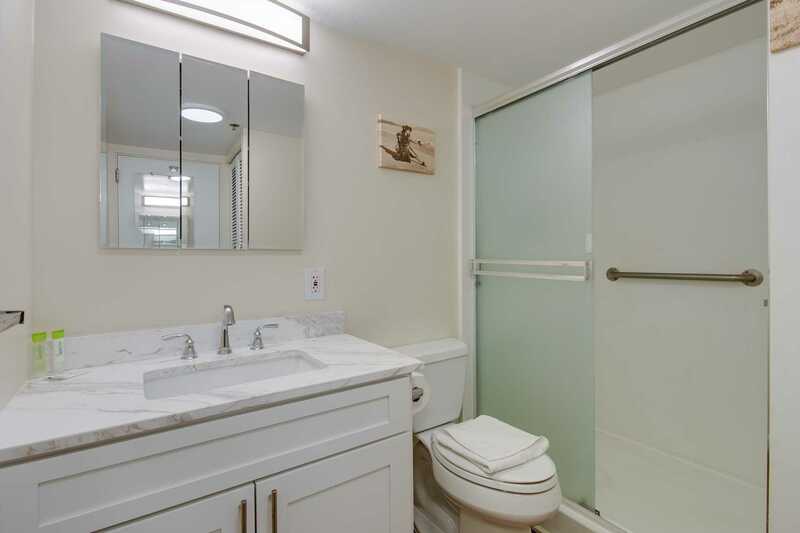 The rate is lower than our fresh remodels. fantastic view and location! the unit was exactly as described. the pillows were pretty worn and flat, but other than that it was perfect for our stay. we would definitely stay here again. Had wonderful time recently at 1504. The pictures were exact. The view incredible, the patio huge, the beds comfy, the room big and the kitchen well equipped. Room did not have central air, but the ac unit worked fine. I only wished the room came with coffee, sweetener and cream. But otherwise spot on. My friends stayed at the 484 unit, also apart of hawaiian vacation properties, a couple of buildings down. It was more updated with fixtures, kitchen and bathroom. But 1504 had the superior view, lanai and was bigger. Next time I'm in Honolulu, I'll be sure to look for this unit. Stayed in 1504 May 14-21 2016. 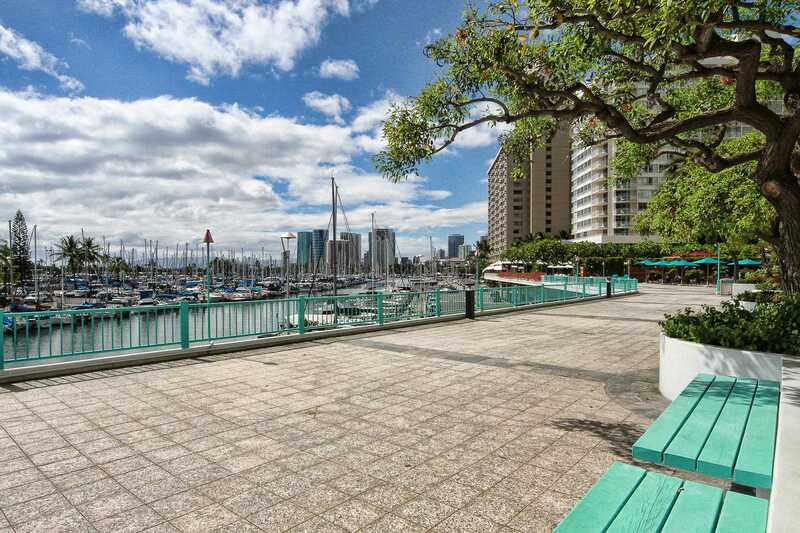 Great unit with a Lanai overlooking the marina and an unobstructed view of the sunset. The unit could seriiously use some fresh paint and a good cleaning but it is well appointed. 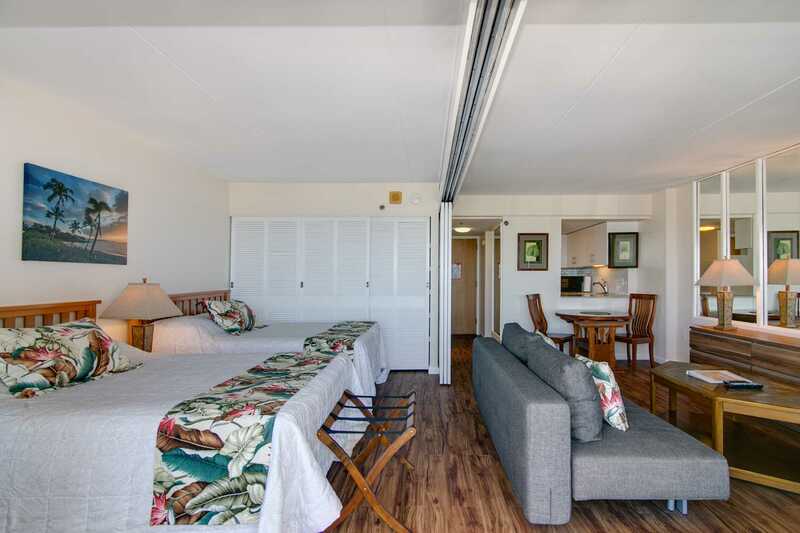 All the comforts of home, the beautiful Ilikai property, great price, huge room with lanai , that all more than makes up for the small faults that can easily be correted. HVP immediately responded to take care of some issues. A+++ I will absolutely book with HVP again. Thank you Tammy, we have done some repainting! 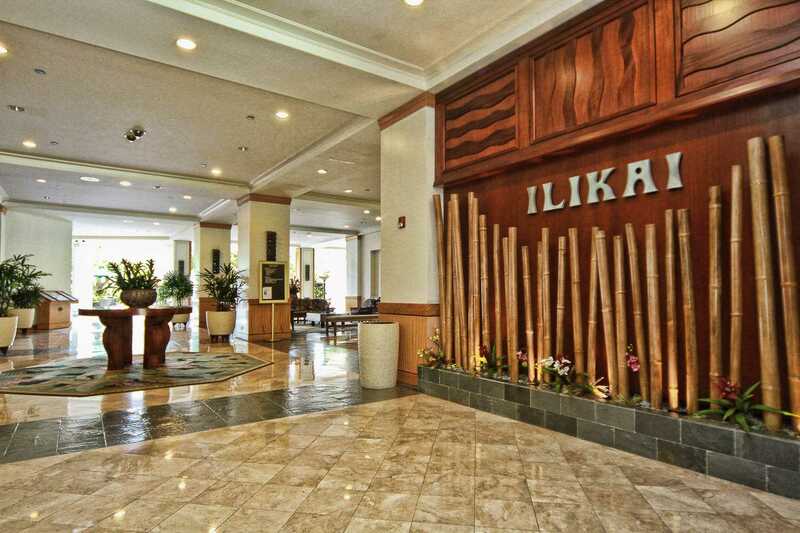 First time staying at the Ilikai Suites and I have to say We absolutely loved it. 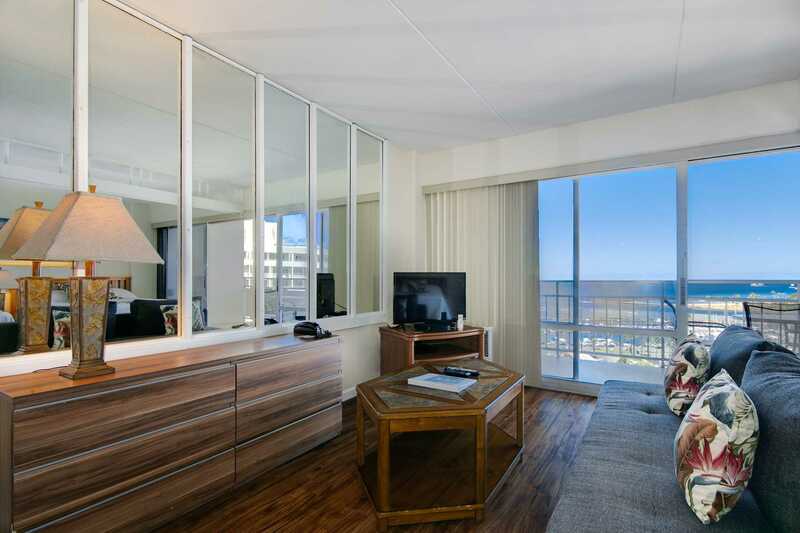 We were 5 in total and it was super confortable the sliding doors gave it privacy to the bedroom side but at same time you have a full view of the ocean from every point in condo. The view is so beautiful you don't even want to leave the room at all. We will definitely stay here again. Cath from the managment team is amazing. My family stayed in Ilikai unit 1504 winter of 2016. 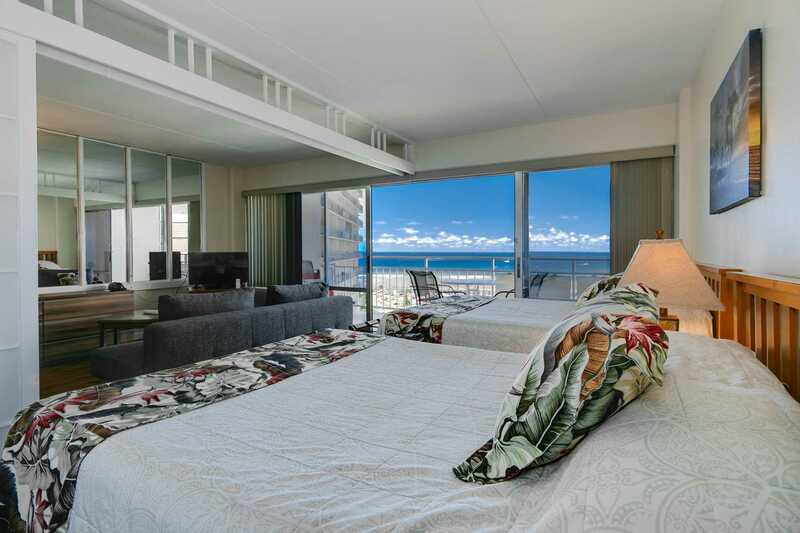 The unit is nicely decorated with a incredible ocean view. The management company that rents this unit is fantastic. Any small deficiencies brought to their attention were corrected immediately. They are very friendly people to deal with. I highly recommend this unit. My friend and I had a great stay at this apartment. The service was top notch and facilities were excellent and building well maintained. What a great spot handy to everything and what a fabulous view! We would definitely come back. Location was very convenient. Close to bus service and convenient close-by parking for tour buses. Suite was very clean with comfortable beds and living room furniture, although we did not take advantage of the flat screen TV. The deck offered outstanding beach and ocean views. Many hours were spent on the deck watching and photographing the splendid views. Four of us shared a mother daughter week in this fabulous condo. 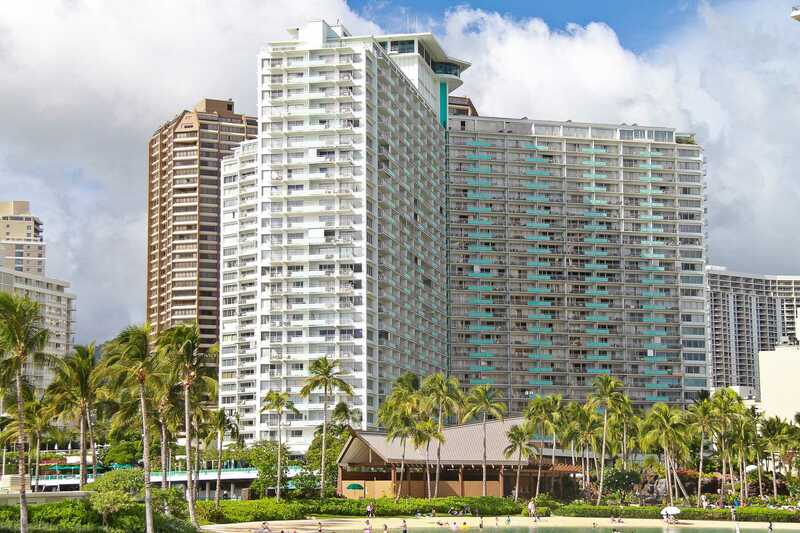 It contained everything we could possibly need and was centrally located between AlaMoana Mall and Waikiki main beach. We loved using the lagoon and beach right next door at the Hilton. The htel staff were great at organising shuttles and cabs. 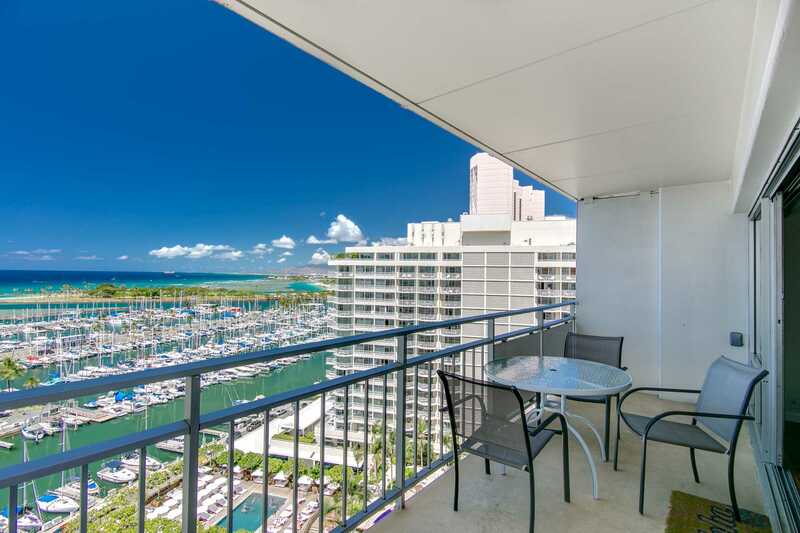 The best part about this condo is the beautiful sunny lanai that overlooks the water. We spent many a happy evening on it sharing a drink. Absolutely loved it and definitely want to return one day. The coded lock meant that any of us could easily return at any time of the day. PERFECT! We stayed at room #1504 and pleasantly surprised at the beautiful view of our condo. This is what grabs you first when you first open the door. Waking up to the beautiful view in the early morning is such a site to behold. The room condo was maintained well and very clean. The kitchen was well stocked with every appliance, pots and pans, that was needed. The bathroom was stocked full with towels that I needed for four people. The laundry room was a minute away down the hall. I did wash all the towels once during the week,but used most of it before my stay was over so couldn't do laundry as I ran out of time. The only suggestion I have is to try to fix the water pressure for the toilet. It is very weak and had to be flushed at least three times. The parking at the condo is very expensive. We had to park at the free parking by the beach/lagoon till 10pm and then do paid parking under the hotel or in the harbor. This was still cheaper than the hotel parking. The WiFi at the condo was 5G so it was very strong. I had homework that were due during my stay so there were no problems in connecting on the internet. The personnel at Hawaii Vacation Properties were helpful and prompt if we needed help with anything. They are friendly and go out of their way to make sure our needs were met. I am definitely going to be calling HVP again for my next adventure. My Husband and I stayed it apartment 1504 with our two young kids in September 2015 for two weeks. It was fantastic , great location short walk to Ala Mona shopping centre and walmart, great access to beach and fantastic sunset view from your room. The two new queen beds were perfect , kitchen and bathroom is old but everything works perfectly. This was a great rental for us. 2 adults with 2 kids. The apartment is great (2 queen beds). 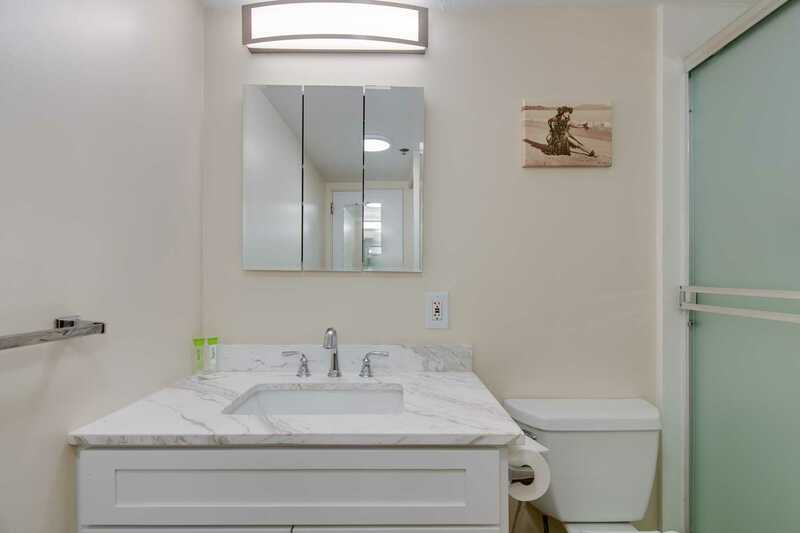 Kitchen and Bathroom can use a re-fresh, but the Lanai makes up for it. The view is worth every penny. 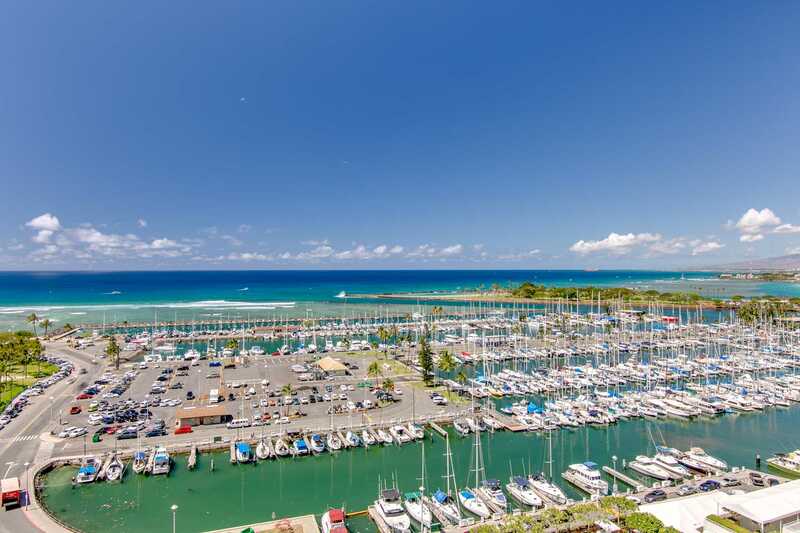 If you are renting a car, the Ilikai Marina parking is $160 USD for the month. If you are staying more than a week it is totally worth it!!! I absolutely loved my stay at 1504 :) The flat had everything that I needed to enjoy my holiday as a home away from home --- with the addition of incredible views of the ocean and yacht harbor. I spent a lot of time on the lanai which is LARGE and runs the entire width of the apartment. The condo was clean upon arrival and had all the amenities one needs in both the kitchen and bathroom, and plenty of space to spread out and relax as a solo traveler. Sunsets were serenaded by the blowing of the conch shell and lighting of tiki torches. If you want a cozy place to stay, prep your own meals, watch the sunsets over the ocean and sleep well at night, then this is the place :) Thanks Kat and Debbie! Our experience was great! We soon learned we appreciated being away from the crowds further down on Waikiki. We loved the Bar and Grill, delicious food with very reasonable prices. The beds are the most comfortable beds I have ever had in a rental. The lanai was perfect for sitting and just looking out over the Marina. I would highly recommend the condo and the management co. is the best. Stayed for a week in unit #1504. The condo and the whole building were very clean and well kept. Enjoyed the great view and the 2 single beds worked well for my daughter and I. Location was also good, easy walking distance to the mall and beach. Place was very quiet, nice restaurant on the first floor. We found $12 parking at Eaton square close by. What could be improved, pillows on the bed were a bit worn out so some new ones would be nice. Kichen & bathroom could probably use an update, glass shower doors kept coming off the tracks. Would be happy to stay again! Beautiful suite with an incredible view. Small problem with shower drain, handled promptly next day with a simple call. 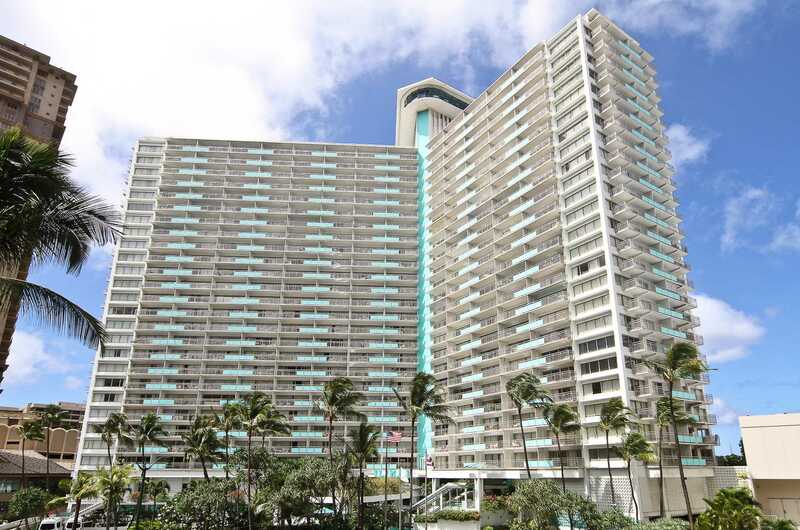 Really nice building and overall great location for those who like Waikiki. We had the most wonderfull vacation ever , in this Apartment ! It had everything you could ask for or need, for a real Hawaii - vacation ! A wonderfull location, with a wiev, you would wish to have at home !! Easy to get to the Trolley, and easy to get to shops........even my husbond has Parkinson , and has difficulty by walking......Everything is close to you........even a laundry, that was also a great plus...... We was on vacation for one week last year, in the Hotel Illikai............and loved the place, there fore we wanted to get back, but we got more for our Money in this Condo this year, and we stayed for two weeks ! "This review originally submitted on VRBO"
Great location, good for weekend getaway! 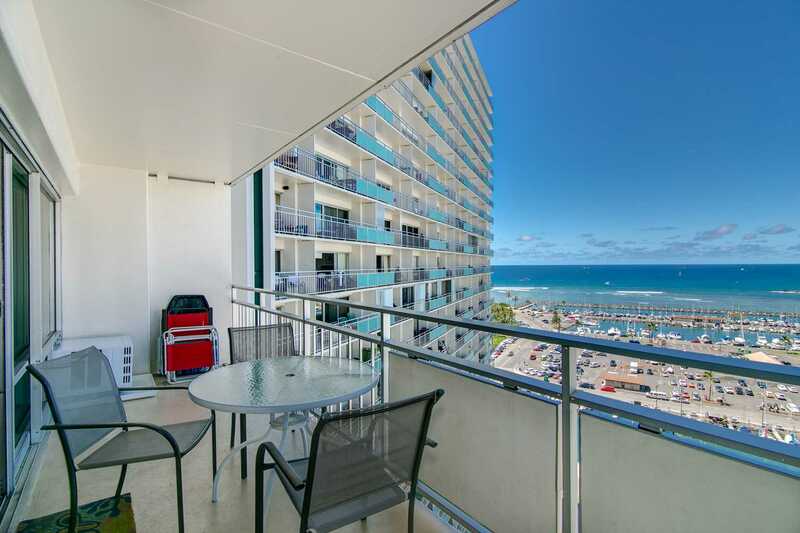 I reserved this condo for me and two other girls who were spending a long weekend on Waikiki. It was wonderful! In the beautiful Ilikai Hotel, with very easy access. Simply used the keycode on the door to let ourselves in and out. The condo is stocked with pretty much everything you need. Parking around there can be somewhat of a challenge, but I found a garage just a block away that is around $25 a night and allowed in-and-out privileges, so that was convenient. We actually used the pool at the hotel next door, which you can see from the balcony and is much nicer than the Ilikai Hotel pool. When we asked for towels, they asked our room number and we told them we were staying at the Ilikai. They said it was okay, as long as their pool wasn't too crowded. The bar at that pool is great too! The location is nice, near the marina, which is a bit quieter than being in the heart of Waikiki, but we were able to walk and/or drive down Waikiki when we wanted to go there. It is great if you're looking for a more relaxing weekend, without all the loud clubs/bars nearby. There are two twin beds and a futon. We found the beds comfortable enough. Guess if you're a couple, you can push the twin beds together? But otherwise, it's a great set-up for a small group of friends (3 or less)!